The West Highland Way. The phonics that blend to give this short phrase its meaning are a source of huge excitement in our house at the moment. Many have walked this 96 mile snake of a walk, rounding its neighbouring high peaks and rivers through some of the most gorgeous bits of Scotland. Many have walked into Fort William or Milngavie with blistered heels and heavy shoulders wondering why they put their bodies through it. But in a few short weeks I will be able to stand proudly and happily and say that I’ve walked the West Highland Way. That is, I hope I can still stand. The walks and trails we follow in the hills of Scotland and elsewhere are like fossils or remains of our past, both recent and ancient. The West Highland Way was only opened in 1980. However the old drovers and military roads that it is built on and around have existed for hundreds of years, long before the first “man in a berghaus” made it look easy. I like looking down at the different path surfaces and imagining who once walked there before me. Their footprints are so deep in places it seems hard to imagine the scars could ever be removed from the earth. Over the last few months our training miles have steadily grown, as has our fitness and confidence. Last weekend we decided to do 2 days walking, roughly 10 miles each day. Saturday saw us venture up to Cairn William. 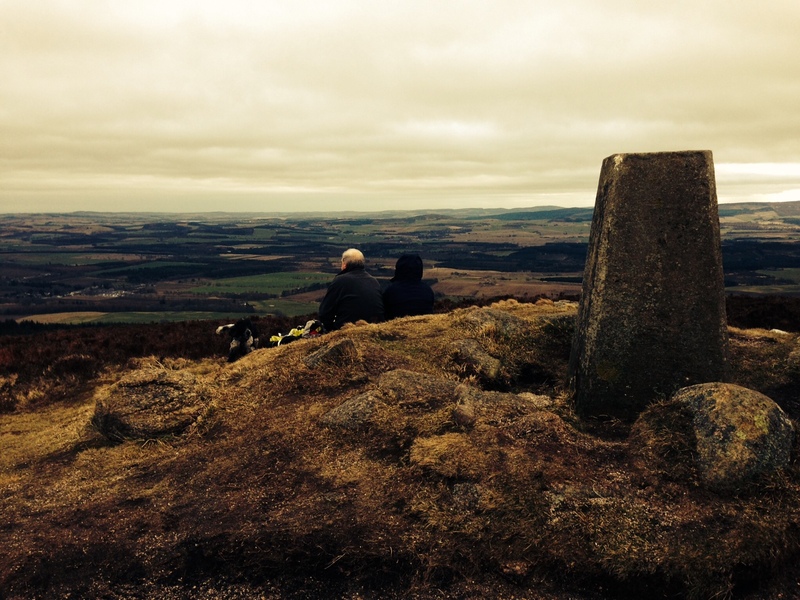 Our walk on Sunday was in the Correen Hills near Alford, a circuit with views of Bennachie, Tap o’ Noth and, most pleasingly, an old abandoned farm called Hillock of Terpersie. I’ve become a bit obsessed recently with dilapidated structures and urban exploration and the sight of the grey granite set against the greens of the surrounding hills was one of many highlights. It might just have been its age, but the building looked so organic, as if it had always been there, not a man-made construction at all. I was further reminded of how exciting our hills are when passing an old quarry and wooden workers hut. Kirsty found something lying on the ground. She thought she had found a fossil, a clay pot perhaps. It turned out to be a gorgeous rock. No less marvellous but I immediately thought back to the farm at Terpersie and was in genuine awe at the things you can find on a simple walk in the Scottish hills. Each one a remnant of a bygone age, whether millions of years ago in geological terms or 200 years in human history. If only they could tell their tales like clyping children. We didn’t have time to stop in at Terpersie for a look. That possibly increased my sense of wonder as I wasn’t quite close enough to get the best view of it. The old abandoned farm, and a thousand others scattered across the country like the seeds farmers sow, are part of our historic record. Through clearance, failure or death, these old homes have been left to nature and reclaimed by her with glee. There is something hauntingly beautiful about a building being overrun by nature. A few of them dotted around the West Highland Way would make the painful blisters and pulled calf muscles worth the effort. Even if I need the services of a wheelchair, a bottle of whisky and a nurse by Fort William. Kirsty, Gordon and Tilly on Cairn William. Lunch being munched.